I used “Sojade” organic soya yogurt but you can also try mashed ripe avocado. It’s best to use an ice cream maker if you have one. It is important to add lime and lemon juice at start to keep good colour and don’t overheat water, if you don’t have time to infuse overnight just leave flowers soaking for an hour at least. 2, 400g tubs of Organic soya yogurt. Put zest, juice, and water into a pan and heat to hot but not boiling. Add flowerheads turn off heat, cover and infuse overnight if possible otherwise for at least an hour. Strain, you should have a good strong Elderflower scented liquid. Return liquid to rinsed pan and add sugar, heat stirring to dissolve sugar. Mix cornflour to a thick paste with a little water, pour into pan stirring all the time, bring to boil and simmer for 3 minutes stirring all the time.Turn off heat and taste, remember you will be adding yogurt and that frozen will taste less sweet. However I like to reduce the sweetness by adding a teaspoon of sea-salt at this stage.Cool the liquid, you can speed up the cooling process by putting pan into a bowl of cold water and ice cubes. In blender blend the yogurt and COLD Elderflower or use a stick blender and large bowl, when well blended, taste adjust flavour to your liking with more sweet, salt or lemon/lime. Churn in ice-cream maker for about 20 minutes and scoop into container. If you don’t have an ice-cream maker place in freezer and freeze for hour, remove and mix to break up any ice crystals, return to freezer and repeat twice or till frozen. Delectable with any desert, Try Fraughan syrup for a final florish. The old fashioned roses are so fragrant just now and I’ve been working on ways to capture their fragrance so it can be enjoyed in depths of winter, very happy with this recipe for Rose Petal Jelly. 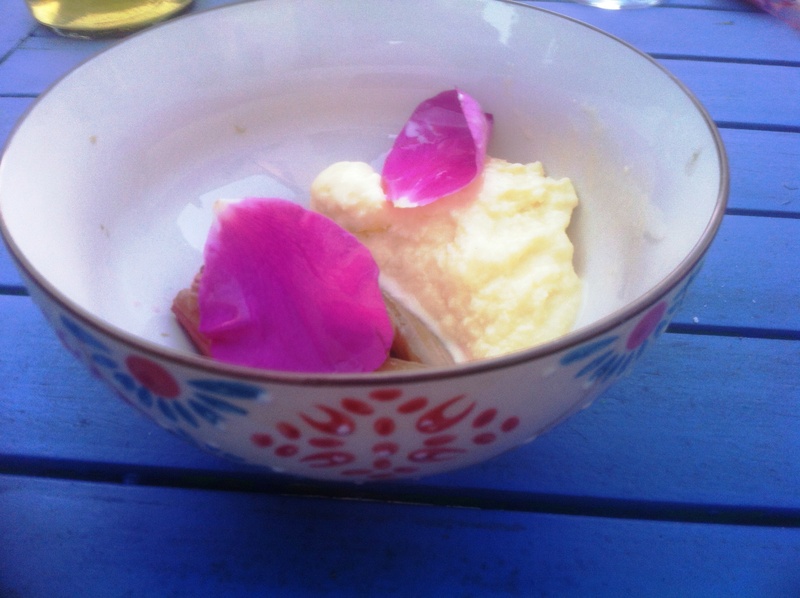 In this recipe the petals are never boiled and retain their essential glory. Rose petals are also used as a remedy for many things. I can’t think of a better food to soothe a battered heart. Have small jars clean and warm ready before you start to make. Put all ingredients except the petals into a stainless steel saucepan, bring to boil, stirring to dissolve sugar. Boil for 5 mins or so, test for setting point. Meanwhile slice the petals into small pieces. When setting point has been reached turn off heat and stir in petals.Pot while hot into jars distributing the petals evenly between jars. Seal as quickly as possible. The petals will infuse in the hot liquid, giving their heavenly scent and colour to the jelly. The jelly freezes very well and is best in small jars so it is used quickly after opening. I am also making a glycerite from petals and will report on progress over the summer. Another beautiful day. I’m really getting used to the sunshine. This evening I’m cooking for my daughter Eve and her hubby Eoin. This is a healthy, vegetarian meal that will of course feature some wild finds as well as fresh garden produce. The star of tonight’s dinner is the wonderful morel mushroom, locally foraged yesterday evening. These are so delicious I will be preparing them very simply. 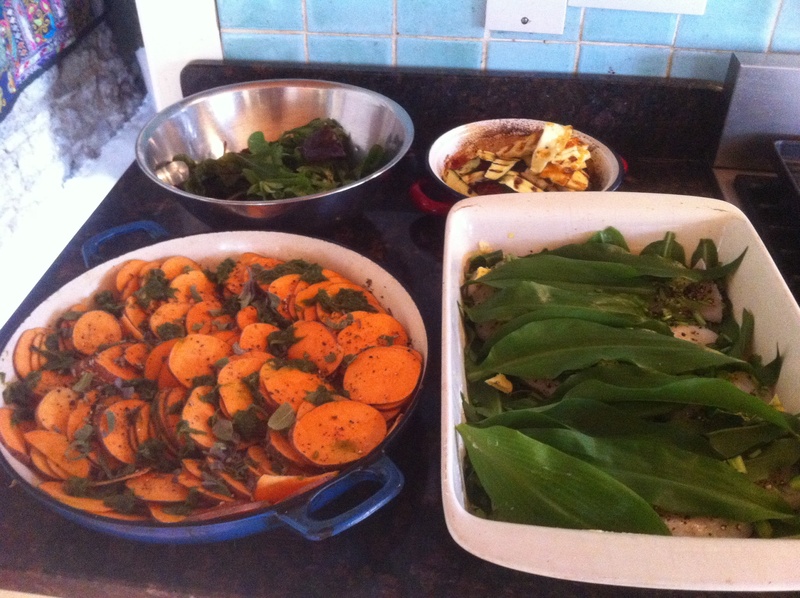 I am also whipping up a wild nettle frittata and we are sampling vegetarian puddings from demadfoodcompany. These will be followed by some wheat and dairy free rhubarb crumble. * You can of course make your own additions like peas, peppers, feta or your favourite cheese. Heat your oil or butter in a large frying pan. Add onion and garlic. Sauté gently for 2-3 minutes until softened. 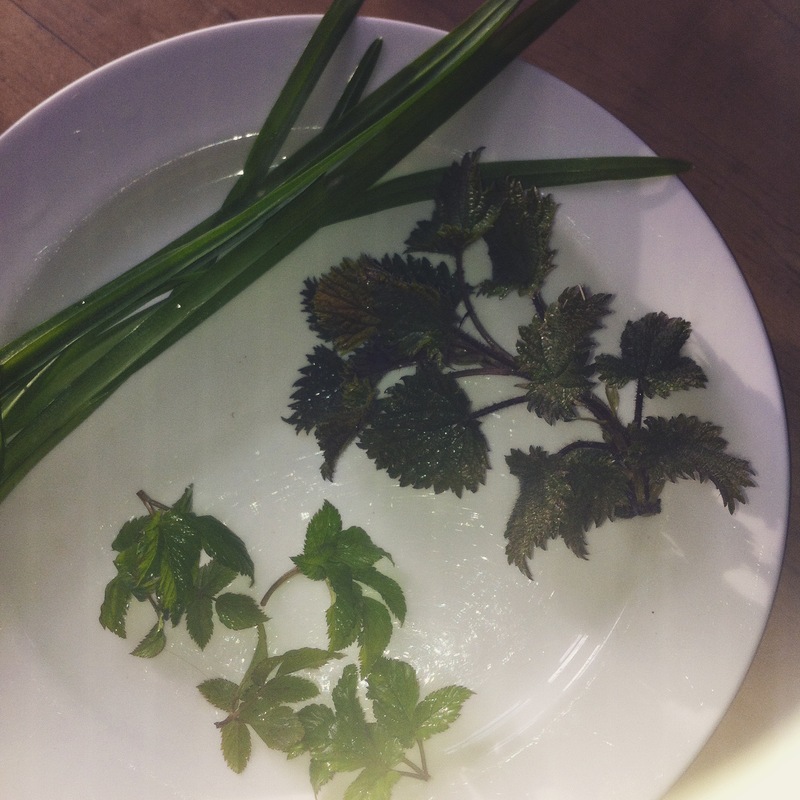 Add the nettle tops, cover the pan and allow to wilt for a few minutes. Add the potatoes and other vegetables if using. Season the eggs with salt and pepper and pour over the potatoes. Allow to cook until beginning to set. Now is the time to add your cheese. transfer your pan to a hot oven or finish under the grill to cook the top until starting to brown. These delicious mushroom must ALWAYS BE COOKED. I am adding some extra flavour with white truffle oil, a gift from Italy. It can be purchased in Italian and other good food shops. This recipe is so simple that the real challenge is in finding the wild morels. Begin by roughly chopping the morels. Heat the butter in a frying pan. Add the morel mushrooms and fry for about 10 minutes. Season with salt and thyme. Remove from the heat and serve with a drizzle of truffle oil. My son-in-law Eoin has a serious soft spot for Rhubarb so I’m delighted to be serving up this dish from the years first cutting. This recipe is wheat and dairy free. I am also using xylitol instead of sugar. You can also use agave or honey. Cooking the base and crumble topping separately ensures a delightful crunch. They can also be stored separately keep well in airtight containers. Preheat your over to 180 degrees. Begin by preparing the crumble topping. Line a baking tray with non-stick baking parchment. In a bowl mix all of your topping ingredients except the coconut oil. Use a teaspoon to scoop in little lumps of coconut oil. Lightly rub in the coconut oil until you have a crumb consistency. Spread the mixture out on the baking tray. Bake for 10 minutes in the preheated oven. Remove from the oven, give it a good stir and return to the oven for a further 10 minutes or until it is golden brown. While the topping is cooking you can prepare the rhubarb filling. Chop the rhubarb. Bring the vanilla, water and xylitol to the boil. Add the Rhubarb, cover and cook gently for about 5 minutes. Be careful not to overcook your rhubarb. It’s nicest when it keeps a bit of its’ shape. 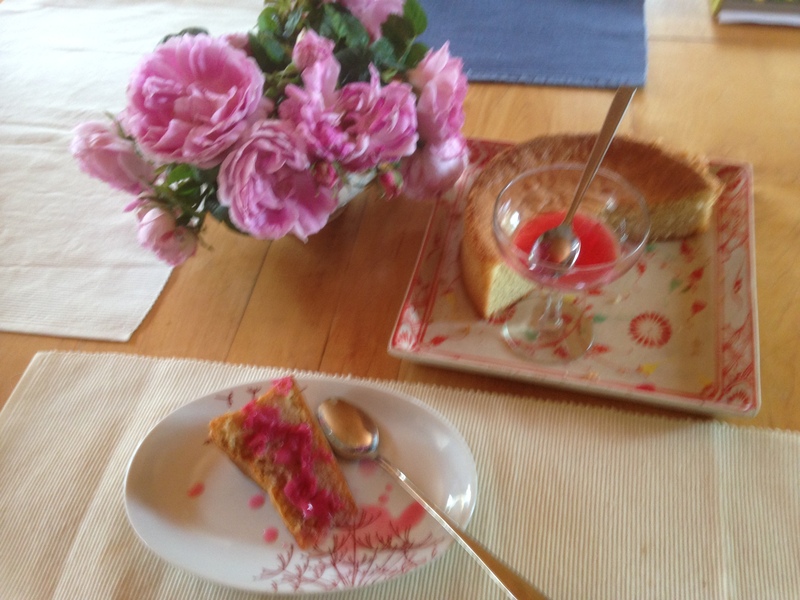 Spoon rhubarb mix into a glass and cover it with the crumble. Enjoy! Heat oven to 200, lightly oil baking dish and line bottom with garlic leaves. 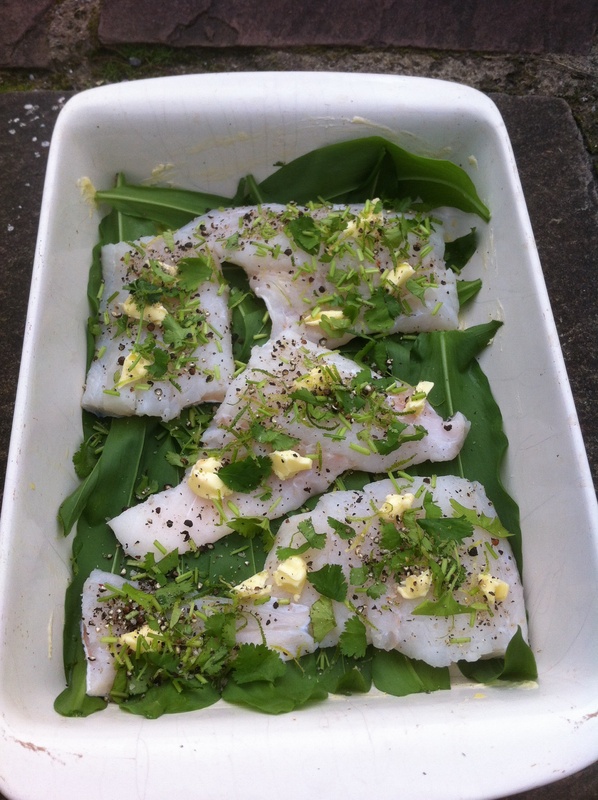 Add fish fillets and top with salt,pepper, chopped Coriander, zest of limes (after zesting cut limes into wedges, serve with fish)Dot with butter and top with remaining Garlic leaves. Cover the dish with baking parchment and bake 15-20 mins till fish is just cooked. I served this with Sweet potato baked with Wild Leek pesto and a salad of Wild and garden greens, Corn salad, Sorrel, Cardamine, Beetroot leaves and young spinach. 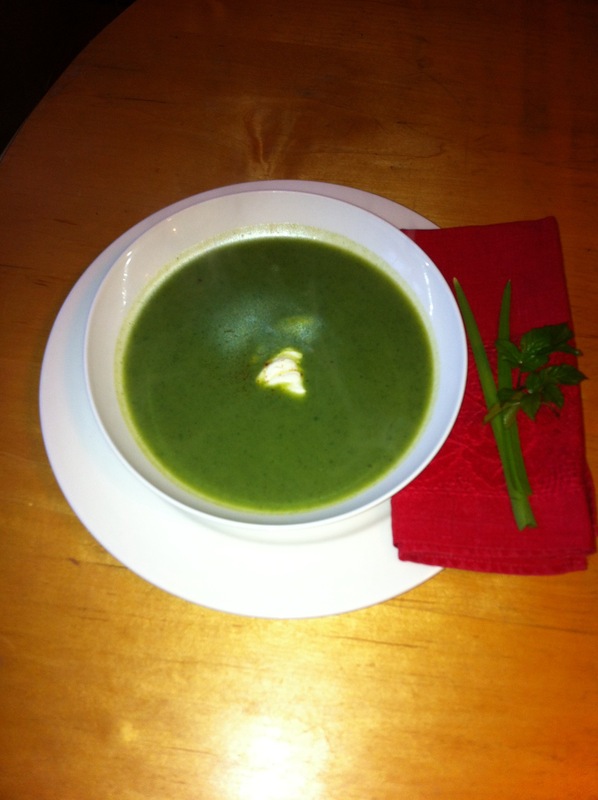 Late February is letting us know that spring is in the air but there is plenty of cold weather about too.Here is a very easy soup using the year’s earliest foraged greens, a real warmer and very good value.The basic recipe is Vegan and gluten free but you could adapt to serve with grated mature cheddar, crumbled feta or even bacon or ham chunks, also if you can mix wild greens a some frozen peas. In a heavy pan warm the oil,add the potatoes and cook for 2-3 minutes, add all the remaining ingredients and bring to the boil, reduce the heat and cook gently until potato is softened. Remove the Thyme sprig and Bay leaves and blitz the soup with a stick blender, taste, adjust seasoning, serve with a scattering of wild gorse blossom or topping of your choice, Creme fraiche; a little feta;grated mature Cheddar; croutons etc. 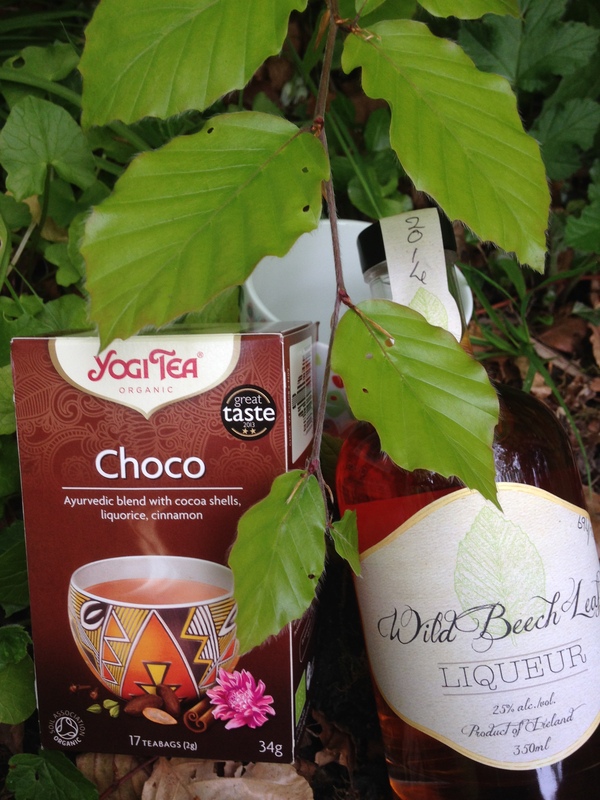 Pack this if you’re off hiking or foraging or on the sideline cheering on your little champions, Enjoy.